When I think of fall I think of cinnamon and spice, apples, and pears, pumpkins and squash, the smell of a wood burning fireplace, leaves turning vibrant colors, and that cool nip in the air that lets you know summer is now just a memory. I am thoroughly enjoying baking with the amazing variety of apples and pears that have arrived in our local grocery stores and markets and seem to be using one of these fall fruits in my cooking on a daily basis at this point. I like to bake for our farmhouse guests, and to keep some type of baked treat on hand for anyone who might stop by for a coffee. I do enjoy a muffin as it seems to be just the right size for a snack, but ensuring that the muffin is not just empty calories can be a tad challenging at times. 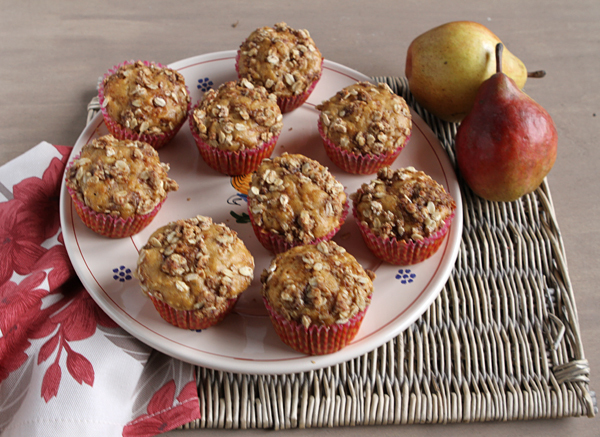 I try and keep my muffins a reasonable size, and to incorporate whole grains, as well as some type of fruit in them to improve the nutritional value. The trick is to tweak the recipe to make it healthier without turning it into a dense, tasteless disaster. 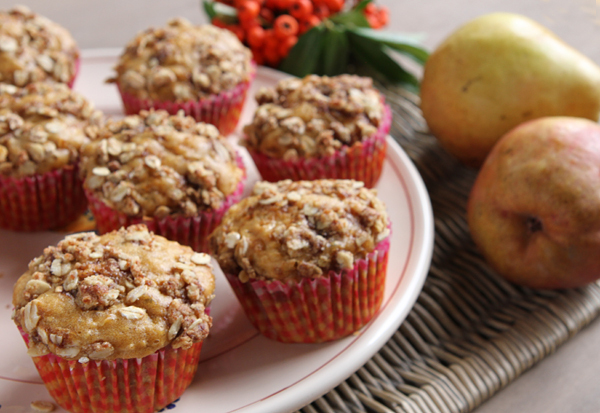 These muffins are very moist and light, and I added a crunchy streusel type of topping to add texture and interest. You could use apples instead of pears if you prefer, but when using pears, choose ones that are ripe but not soft. Whole wheat flour replaces half the white flour, and whole grains are a good source of fiber as well as calcium, iron, phosphorus and other minerals, and contains several vitamins, including folate and riboflavin. Olive oil replaces less healthy butter. Flaxseed is the most widely available botanical source of omega-3 fatty acids. Preheat oven to 350 degrees F. and line a standard muffin tin with papers or nonstick baking spray. In one bowl, combine the two flours, baking powder, cinnamon, nutmeg, and salt. In another bowl, whisk together the milk, olive oil, sugar, and eggs until blended. Pour the wet ingredients into the dry and stir just until mixed. Fold in the pears or apples. Spoon the batter evenly into the muffin cups. In a small bowl, mix together the topping ingredients with your fingertips until crumbly. Sprinkle a little of the topping over each of the muffins, then bake for 13 to 15 minutes or until set.